Forgive the pun, I came up with so many when I was there. I couldn’t help myself, it was like word vomit that couldn’t be stopped. Czech please! Spell Czech. Czech this czech out! Apart from the sad puns, I WENT ON THE BEST WALKING TOUR OF MY LIFE!!! We went on one by Sandeman’s and Michael was probably the most hilarious and enthusiastic tour guide I’ve had thus far. Other than showing us around Prague, he also highlighted a few quirks about post-communist countries that I guess most people write off as being rude. For example, it’s usual for waiters to leave you to your meal instead of asking you “Is everything okay?” as they often do midway through a spaghetti slurp in the UK. Michael explained that this is because those who were once under the communist rule preferred to mind their own business because back then, that’s what people did. He blamed the secret police. If one in every three persons was an informant, I think I’d keep my trap shut and eyes to the ground to avoid suspicion too. The last standing tower gate. Smoked ribs. My dinner was better than yours. I bought a ticket to Krabat, the ballet! People were dressed to the nines in suits and gowns, I was dressed in.. clothes. It’s a UNESCO heritage site because it was not blasted to smithereens in the second world war. It’s a really beautiful place, three hours away from Prague. We went on a free walking tour that ended in the castle. It leads to a ginormous garden with an open air theatre and a lake at the end of it. For anyone planning to go there, consider going to the open air theatre that is really one of a kind. The garden transforms into a theatre and the seating area, which is on a circular platform, rotates as the actors run from one end of the garden to the other. Shows start at night so you might need to spend a night there. Back in the day, this town was really successful due to the amount of silver that was mined here. The town became the main producer of the silver coins used in some empire.. I was a little distracted by all the bones around me. 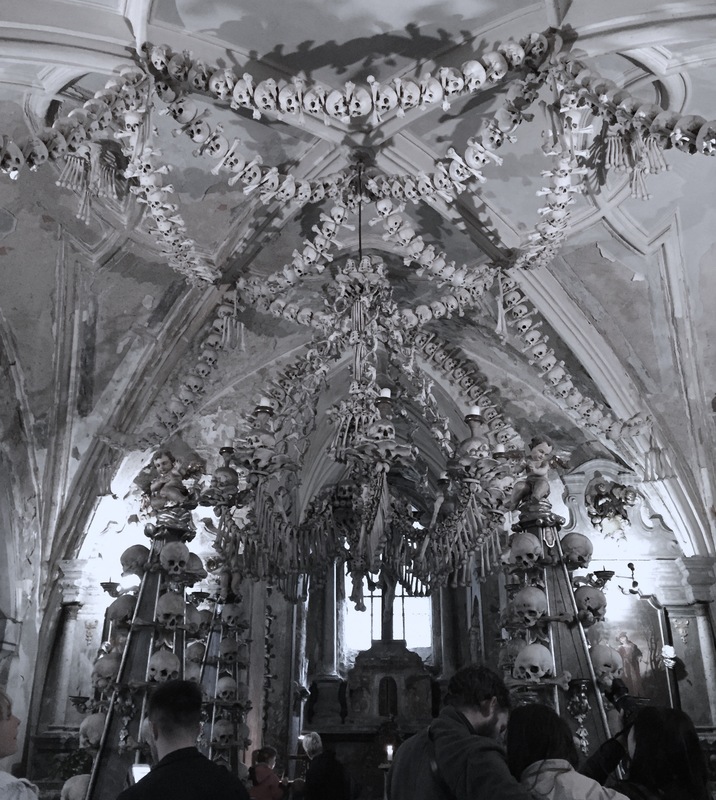 The Bone Chapel was decorated by 40,000 human bones. Most of them died from the many wars that occurred here. Others were victims of the plague that also killed John the Blind. My stay was short and sweet, barely long enough to even scratch the surface of such a beautiful place with great beer. Till next time Czechs!